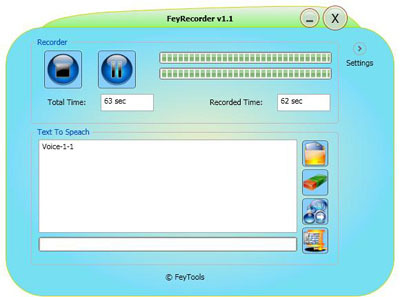 FeyRecorder is a multi-purpose audio tool able to carry out various sound tasks including: conversion from CD, tapes, DVDs, live concerts, TV sounds, online radio, video games and any other sound sources into audio files that can be easily saved on the hard drive. The abilities of the program go even further by integrating text-to-speech conversion with natural voices which enables you to listen to your text documents at any time. Once the settings configured - the sound source, the recording quality, and volume, you are ready to press the record button. You just need to select the format you want and click on the Record CD button. In order to prevent duplicate conversions, required file format conversions are performed automatically using smart caching. Qweas is providing links to FeyRecorder 1.2.0 as a courtesy, and makes no representations regarding FeyRecorder or any other applications or any information related thereto. Any questions, complaints or claims regarding this application FeyRecorder 1.2.0 must be directed to the appropriate software vendor. You may click the publisher link of FeyRecorder on the top of this page to get more details about the vendor.